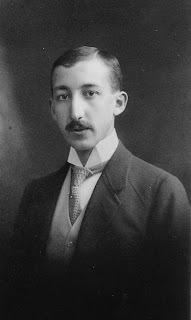 Georg Charles de Hevesy was born on August 1, 1885 in Budapest, Hungary. He was the fifth of eight children of Louis de Hevesy, a public prosecutor and Eugenie (Schossberger) de Hevesy. Beginning in 1903 he attended Budapest University and Berlin Technical University studying chemistry, physics, and mathematics. He earned his doctorate in chemistry at the University of Freiburg im Breisgau in 1908. He worked for two years at the Institute of Physical Chemistry, Technical University of Switzerland before working for a short spell with Fritz Haber and seeing much of the fundamental work Haber did developing the Haber process to synthesize ammonia. He traveled to Manchester, England in 1910 to study under Ernest Rutherford. Rutherford gave him the task or separating out the radium D from the large amount of lead in a sample of Joachimsthal pitchblende which had been given as a gift by the Austrian government. Of course, try as he might de Hevesy was not able to complete the separation. He was able to use radium D and radium E as a radioactive tracer in investigations of the kinetics of lead and bismuth in plants. Radium is the heaviest of the alkaline earth metals (group 2 on the periodic table) and is intensely radioactive. The products of radium's decay have been historically known as A, B, C etc. Radium D is now known as lead-210, so of course de Hevesesy was unable to separate the radioactive lead isotope from the non-radioactive lead by normal chemical means, but he was able to use it as a radioactive tracer. Other experiments he performed using radioactive isotopes as tracers included using duterated water (water with radioactive hydrogen) as a tracer to determine the amount of water in the human body and using radioactive phosphorus to determine the rate of deoxyribose nucleic acids in liver and kidney cells. He also was able to determine the lifespan of red blood cells and the doubling time of artificially induced tumors using radioactive tracers. In 1919 de Hevesy went to work at the Bohr Institute for Theoretical Physics in Copenhagen (he had become friends with Niels Bohr while working in Manchester). Bohr had de Hevesy investigated samples of zircon ore for element number 72, then an empty space on the periodic table. Working with Dirk Coster, he was able to find the missing element and named it hafnium, after the Latin name for Copenhagen, Hafnia. In 1940, when Germany invaded Denmark, de Hevesy dissolved the Nobel Prizes of Max von Laue and James Franck in aqua regia, to prevent the Germans from stealing them, and placed the solution on a shelf in the Bohr institute. Afterwards he was forced to flee Denmark to Sweden, because of his Jewish ancestry. After the war he returned to find the solution still on the shelf where he had left it and precipitated the gold out. He gave the gold to the Nobel Society, which recast the prizes. In 1943 de Hevesy was awarded the Nobel Prize "for his work on the use of isotopes as tracers in the study of chemical processes". De Hevesy died on July 5, 1966.